There I was, happily working my weight down to where I want it, when Karen Seiger at Sirene Media Works and Markets of New York City asked me to shoot the New York Chocolate Show. Rock < Chocolate Show > Hard Place. I like to shoot food and I like to shoot foodies. And I like good chocolate. So at great sacrifice to my personal well-being, I went. One of the reasons I was eager to go was to find solutions for some problems for a workshop I’m putting together on photography for food writers and bloggers, and one of the problems is lighting. 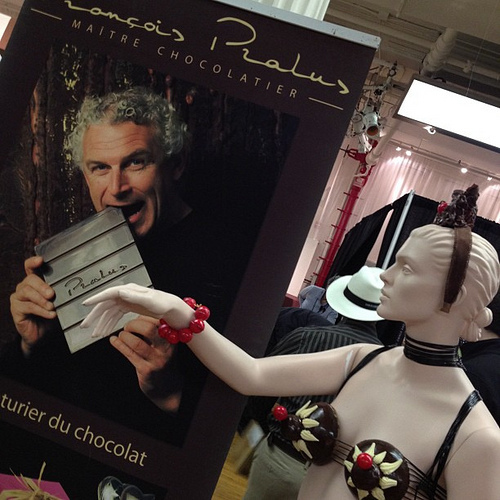 I was struck by a lot at the show, and you can find some photos from my story of chocolate as art here. I was interested in getting some interesting photos without a lot of gear, in a short space of time, and under the visually chaotic and crappy varied lighting conditions of a trade show. I’d recently bought a LED light panel (a 4 X 6 LED array, CF9014 from Calumet Photo as was) and happened to bring it along. It’s designed to go on top of a video camera, runs on 4 AA cells, is pretty small, and has a swing-put-of-the way diffusion screen and CTO filter attached. And it works pretty well. I’m interested in matters historical, having been in the history business in a past life, and found a booth manned by the historical division of Mars, called American Heritage Chocolate. (I wish I’d thought of that one …) They were reproducing a 1750s-era American colonial recipe for a spiced hot chocolate, and were grinding the cocoa nibs and spices on a heated stone mortar. A black stone mortar. In the dark. (Well, near dark.) So I pulled out the LED panel, dialed it up a little over the darkness, and filled in the darker bits, giving some decent specular reflections to the chocolate, and getting some details where there had been none visible. Try it. 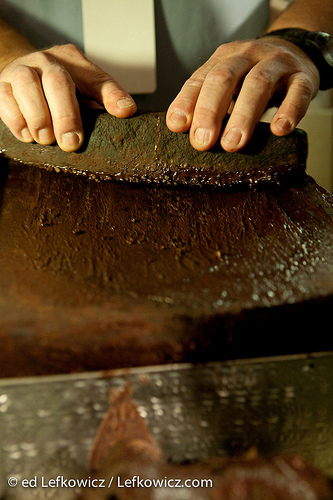 More photos of the American Heritage Chocolate exhibit at the New York Chocolate Show. Tech notes for those to whom these things mean something: Canon 5D, 24-70mm f/2.8 L lens, ISO 1000, 1/50 sec, f/4. Handheld. Every try to get a tripod into one of these shows? You’ll break something. Or someone. LED panel used on the one shot of the grinding only. I shot some of the story with an Olympus E-P2, Panasonic 20mm f/1.8 lens.